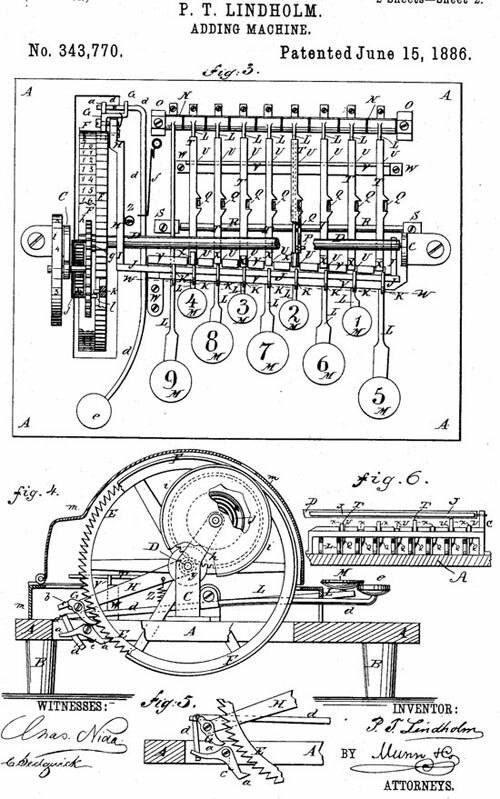 In 1885 Peter T. Lindholm from Lindsborg, Kansas, applied, and in 1886 received a patent for a key-driven one column adding machine (US patent №343770, see the lower patent drawing). In 1886 Lindholm received also a Canadian patent for 5 years (№24448, 7 July, 1886), a French patent (№176777) and a Great Britain patent (№7874). Only one device seems to survive to our time, now in the collection of the Arithmeum Museum, Bonn. 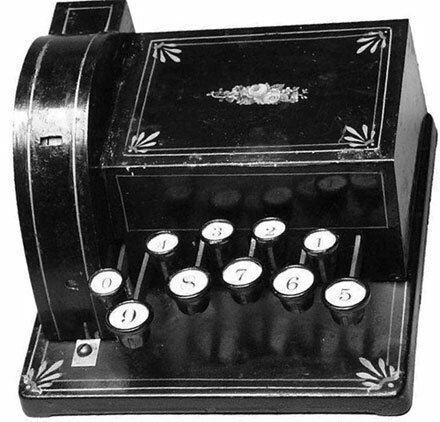 Who was the inventor—Peter Lindholm? Peter T. Lindholm was born on 4 April, 1850, in Sweden and emigrated to USA about 1874. He settled in Lindsborg in 1883 (Lindsborg is a small town in the Smoky Valley region of north central Kansas, in McPherson County, settled in 1869 by some 100 Swedish immigrant pioneers), invited as a professor of mathematics at the just founded (in October, 1881) Bethany College. Peter T. Lindholm lectured at Bethany College for over two years, and in the fall of 1886 he was elected treasurer of McPherson county, a position, which he kept until his death in 1890. He was also a choir-master of the local oratorio society. Peter T. Lindholm died of consumption on 25 January, 1890, only 39 years old, leaving a wife and five children. where b is a blank space (meaning a zero). Attached to this wheel is a watch spring that is wound up when any addition is performed, thus keeping the large wheel in place against the pawls, and it is attached to the small wheel by gearing, that wheel is also normally locked in place. In operation the device is set to zero by first pressing the 0 key: in the results window then reads b00 (b indicates a blank from hundreds wheels, 00 is coming from the larger wheel. When a different from 0 key is pressed, it causes a pawl to act against the large wheel in proportion to the number being added. The large wheel turns away from the operator and the smaller one towards him. The angle turned is in proportion to the key just pressed, e.g. by pressing the 9 key eleven times, 99 is input and the result window will show b99. When one is added, the tens carry will happen, the larger wheel will advance to 00 and the gear will transfer the motion to the smaller wheel, advancing it to 1, thus the result, seen through the apertures, will be 100. The sum of the wheels is fixed in place by 2 pawls operating on the larger 100-tooth gear. Thus, when the 0 key is pressed, the pawls are released causing the wound springs to turn the two wheels back to their starting positions (zero-point). 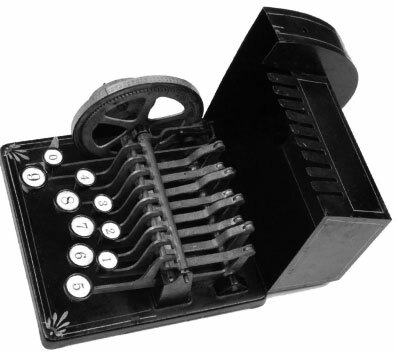 In the collection of National Museum of American History is kept a device, which is quite similar to the adding machine of Lindholm (see the upper image), it is unknown however what is the relation of this probably later device with the original patent of Lindholm. 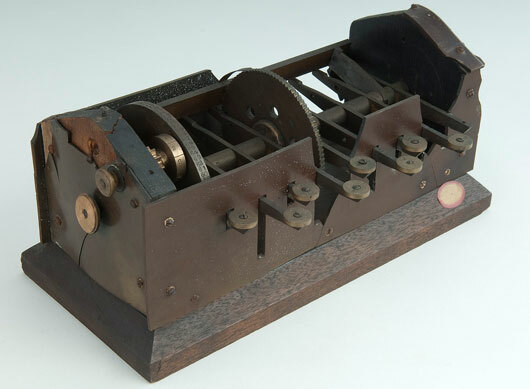 The above mentioned machine has a wooden base, plastic sides (the plastic sides mitigate against a 19th century origin), and a metal mechanism and keys. A bar across the back is moved in differing amounts according to the key pressed (the nine keys across the front are depressed in slots of varying length and hence rotate the bar varying amounts). The bar, in turn, rotates a numeral wheel with the numbers 0 to 99 on it. There is a one-digit carry. Keys are marked with the digits from 1 to 9 (the 5 key is missing). There is no 0 key.